If you’re one of the growing number of consumers concerned about the effects of VOC’s on indoor air quality, you may already know that carpet is a prime suspect. The synthetic fibers and adhesives used in carpeting have been known to out-gas harmful fumes for weeks after installation (remember that “new carpet” smell?). And what’s worse, two of the most common carpet fibers — nylon and polypropylene– are both petroleum-derived and only enhance our dependence on non-renewable fossil fuels. Thankfully, stylish rug-maker, Merida Meridian, will have none of that. Natural fiber carpets are the healthiest and most eco-friendly way to keep your floors feet-friendly and Merida is a leader in both design and technical innovation. The 30-year-old company offers perhaps the most diverse collection of 100% natural fiber floor coverings on the market. Their Central Park design was even selected to be part of the permanent Architecture and Design Collection at the Museum of Modern Art. 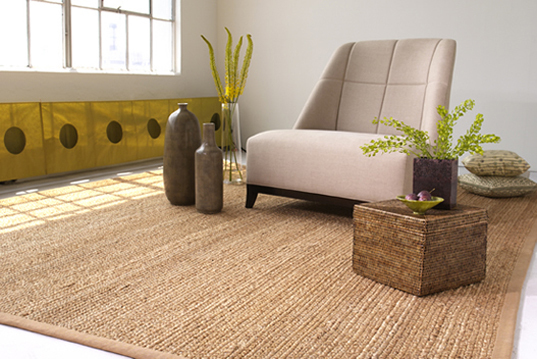 Initially entering the natural floor covering business with sisal, Merida has since diversified its production to include a diverse array of woven carpets and area rugs using renewable fibers such as coir, jute, hemp, sea grass, abaca, and wool — all with natural latex, jute, or cotton backings. They’ve also created a unique floor covering woven from twisted paper cord harvested solely from managed forests. All of the rugs can be ordered in custom sizes or shapes, and further personalized with over 300 different edge finishes from cotton twills to full grain leather. Those are some nice rugs! I know when I buy my own place I'll definitely be putting down some eco-friendly wood (probably the fake stuff) and some rugs similar to these! If you're one of the growing number of consumers concerned about the effects of VOC's on indoor air quality, you may already know that carpet is a prime suspect. The synthetic fibers and adhesives used in carpeting have been known to out-gas harmful fumes for weeks after installation (remember that "new carpet" smell?). And what's worse, two of the most common carpet fibers -- nylon and polypropylene-- are both petroleum-derived and only enhance our dependence on non-renewable fossil fuels. Thankfully, stylish rug-maker, Merida Meridian, will have none of that. Natural fiber carpets are the healthiest and most eco-friendly way to keep your floors feet-friendly and Merida is a leader in both design and technical innovation.